How To Apply For A PAN Card: Indians use the Permanent Account Number (PAN) Card as an identification document for different purposes. 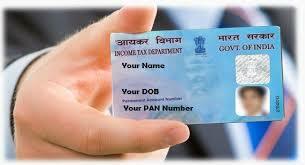 Many PAN cardholders neither work nor file tax returns but have the PAN card solely for the purpose of identification. Applying for a PAN card is very simple. You can do it online or via a govt. app. Want to know how? Find out here! The Income Tax department has simplified the process of applying for a PAN card. While the PAN card could earlier be obtained only through middlemen, who were usually Chartered Accountants, today the PAN card can be easily applied for online. This is an easy and user-friendly process, with clear instructions and guidelines given at every stage. Visit the website of the Tax Information Network – https://tin.tin.nsdl.com/pan/. This is the home page of the Income Tax department and offers different services such as applying for a new PAN, tracking the status of tax refund and online PAN verification. The applicant can choose the service that they want. To apply for a new PAN, Form 49A will need to be used. Form 49A can be filled online by visiting https://www.tin-nsdl.com/services/pan/pan-index.html. Fill in the details and submit the form online. After the form is submitted successfully, an acknowledgment is displayed. You will get a unique 15 digit acknowledgment number. This acknowledgment must be saved and printed. The acknowledgment form must be sent to the Income Tax department. Before sending this, you will need to attach a few documents along with the acknowledgment form. This includes proof of address and proof of identity. Your name which is mentioned in these documents should be in the same format as that on the PAN application form. Keep this in mind when you are filling Form 49A. You must also affix two recent color photographs on the acknowledgment form in the applicable space. Signatures have to be made where indicated. The photograph you affix should be clear and a recent one, as this is the same photograph which will be used on your PAN card. The steps above are simple and self-explanatory. There are adequate instructions, guidelines and a list of do’s and don’ts on the website that will guide you in the PAN application process. The application status can be tracked online after the acknowledgment has been sent. Payments made can also be tracked online. NSDL also offers the facility of tracking by writing to them at their address or by sending anSMS to 57575 by typing SMS NSDLPAN <space> Acknowledgement No. The process of changing or correcting the details of your existing PAN card is similar to the process of applying for a new PAN card. Fill in the PAN Change Request Form online and follow the steps above. This PAN change request section also has separate guidelines, instructions and do’s and don’ts. Now you no longer have to depend on someone else to get a PAN card for yourself or anyone you know. Simply follow the steps above and you’re all set. Related Posts of "How To Apply For A PAN Card"